"Duncan I" redirects here. For the later Scottish nobleman, see Donnchad I, Earl of Fife. Donnchad mac Crinain (Modern Gaelic: Donnchadh mac Crìonain; anglicised as Duncan I, and nicknamed An t-Ilgarach, "the Diseased" or "the Sick"; ca. 1001 – 14 August 1040) was king of Scotland (Alba) from 1034 to 1040. He is the historical basis of the "King Duncan" in Shakespeare's play Macbeth. He was a son of Crínán, hereditary lay abbot of Dunkeld, and Bethóc, daughter of king Máel Coluim mac Cináeda (Malcolm II). Unlike the "King Duncan" of Shakespeare's Macbeth, the historical Duncan appears to have been a young man. He followed his grandfather Malcolm as king after the latter's death on 25 November 1034, without apparent opposition. He may have been Malcolm's acknowledged successor or Tànaiste as the succession appears to have been uneventful. Earlier histories, following John of Fordun, supposed that Duncan had been king of Strathclyde in his grandfather's lifetime, between 1018 and 1034, ruling the former Kingdom of Strathclyde as an appanage. Modern historians discount this idea, although it is supported by the ODNB..
An earlier source, a variant of the Chronicle of the Kings of Alba (CK-I), gives Duncan's wife the Gaelic name Suthen. Whatever his wife's name may have been, Duncan had at least two sons. 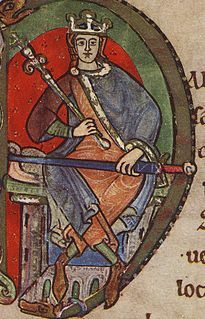 The eldest, Malcolm III (Máel Coluim mac Donnchada) was king from 1058 to 1093, the second Donald III (Domnall Bán, or "Donalbane") was king afterwards. Máel Muire, Earl of Atholl is a possible third son of Duncan, although this is uncertain. The early period of Duncan's reign was apparently uneventful, perhaps a consequence of his youth. Macbeth (Mac Bethad mac Findláich) is recorded as having been his dux, today rendered as "duke" and meaning nothing more than the rank between prince and marquess, but then still having the Roman meaning of "war leader". In context — "dukes of Francia" had half a century before replaced the Carolingian kings of the Franks and in England the over-mighty Godwin of Wessex was called a dux — this suggests that Macbeth may have been the power behind the throne. In 1039, Duncan led a large Scots army south to besiege Durham, but the expedition ended in disaster. Duncan survived, but the following year he led an army north into Moray, Macbeth's domain, apparently on a punitive expedition against Moray. There he was killed in action, at Bothnagowan, now Pitgaveny, near Elgin, by the men of Moray led by Macbeth, probably on 14 August 1040. He is thought to have been buried at Elgin before later relocation to the Isle of Iona. Duncan is depicted as an elderly king in the play Macbeth (1606) by William Shakespeare. He is killed in his sleep by the protagonist, Macbeth. In the historical novel Macbeth the King (1978) by Nigel Tranter, Duncan is portrayed as a schemer who is fearful of Macbeth as a possible rival for the throne. He tries to assassinate Macbeth by poisoning and then when this fails, attacks his home with an army. In self-defence Macbeth meets him in battle and kills him in personal combat. In the animated television series Gargoyles he is depicted as a weak and conniving king who assassinates those who he believes threaten his rule. He even tries to assassinate Macbeth, forcing Demona to ally with the Moray nobleman, with Duncan's resulting death coming from attempting to strike an enchanted orb of energy that one of the Weird Sisters gave to Macbeth to take Duncan down. ^ Bishansky, Greg (13 March 2013). "Station Eight : Gargoyles : Ask Greg Archive : Duncan". S8.org. Retrieved 18 April 2017. Duncan: This guy was a jerk. I mean, really. A paranoid tyrant who thought the world was out to get him. Well, not the world so much as his cousin, Macbeth. I suppose I can understand seeing Macbeth as a threat to the throne, but he just seemed to go out of his way to make Macbeth miserable. He reveled in it. When he died, we were all happy to see him bite it.